The Kawai KDP90 review will help you to make sure that it is the right model for you. Understanding the pros and the cons of this model can help you to make sure that you are making a sound investment in your new electronic piano. Choosing the best digital piano for your needs and preferences can help you to reach your musical goals. The Kawai KDP90 may just be what you have been looking for. If you are a piano student you know that one of the most important things you can do to improve your skill level is to practice, practice, practice because practice truly does make perfect. Having a practice piano at home can help you to improve your skill level. Unfortunately, a baby grand is not an option for many of us, in many cases an upright is not an option either. A good electric piano with weighted keys is a great alternative for practice purposes. There are some clear benefits to an electric piano but none greater than the ability to fit just about anywhere. Of course you want an electric piano that is closely matched to the acoustic piano. Having a piano to practice on that comes as close as possible to an acoustic piano will ensure proper form, finger placement and good practice habits. 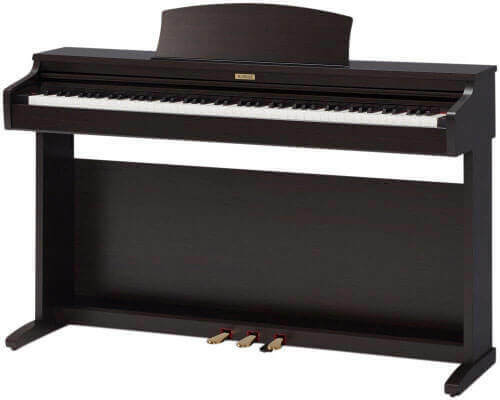 The Kawai KDP90 fits the bill nicely for coming as close as possible to an upright acoustic without the space requirements and the costs that are associated with acoustic pianos. Read more about the Kawai to get a better idea of why this electric piano comes so highly recommended. Koichi Kawai fell in love with music. His story is one of a great passion for music and an unexpected journey. He was a piano player. He loved classical music and was always on a quest to find the most perfectly tuned pianos. He had a bevy of theories when it came to music and the affect that instruments had not only on the composition of the music but on the confidence of the musician. He wanted to put his theories to the test on how to better improve string and percussion instruments. Long before he ever created his first instrument he put hours upon hours into research and development, testing many of his early pianos himself in front of an audience. Koichi Kawai began his Instrument research institute in 1927 and set out to create reliable musical instruments that would far surpass any of the instruments that were available at the time. After the first year Mr. Kawai was able to create his first grand piano. His first piano was hailed by music critics as a wonderful work or art. Mr. Kawai paid as much attention to the detailing of the cabinet as he did to the mechanics of the piano. It was a huge first hit in what would become a long line of successes. By the 1930’s the Kawai Music Company had added other instruments like reed instruments and harmonicas, which was also met with accolades. By 1937 with the kick off of the war production of the musical instruments was halted and the factory was used for the production of war machines but Mr. Kawai continued with his research and development activities because he knew once the war ended he would once again focus on musical instruments. By 1946 some of the focus turned from musical instruments to furniture and cabinetry because it was more lucrative. The company did continue to make musical instruments but found that more people were interested in the beautiful cabinetry and other furnishings that he made. He added accordions to his repertoire of musical instruments during this period. In 1948 focus was again changed to pianos and organs to meet customer demand. The Koichi Kawai Musical Company became world renowned for creating highly reliable and dependable musical instruments. In 1953 Kawai Musical Instruments was awarded the Blue Ribbon for musical standards. The Blue Ribbon had never been awarded before to a piano manufacturer. The company has continued to experience regular growth and receive accolades. Basically this is a company with a very long history of providing dependable musical instruments that you can trust. Kawai continues to be innovative and creative when it comes to the instruments that they develop. They put a lot of time and effort into every instrument that they build and it shows. Kawai is well known for creating instruments that are built to last. This is a great practice piano for any level of expertise. Anyone that needs a reliable piano to practice on will appreciate the rich tones of the Kawai KDP90. It offers just the right balance as a practice piano and it is compact enough to fit just about anywhere. If you are on a budget and want a really reliable great sounding digital piano for practice, then you need the Kawai KDP90. What Does the Kawai KDP90 Have to Offer? Kawai sets very high standards for all of their instruments and the KDP90 is no exception. The Kawai KDP90 offers great performance at a reasonable price. The KDP90 is an exceptional digital piano option for beginners as well as for some more experienced players. This model is a four-hands model which means that the splits the keys identically which makes it easier to play. The harmonic imaging sound technology of the 88 key sampling offers F graded-hammer. It is polyphony built with a feel pedal system. It offers a sliding key cover with a stereo speaker system. The System Sustain pedal is sold separately. It offers effects like reverb and three other effects which is a nice touch. It comes with a high quality (furniture quality) matching bench that looks great and is really sturdy. Basically it is ready to play upon its arrival. Everything about this setup is high quality. The moving parts, the speakers, the cabinet and the bench all look and work great. The product description does not mention the bench but the bench is included. The Kawai KDP90 is ideal for anyone on a budget that wants a reliable instrument but does not want to have to break their budget to find one. The weight of the keys on this piano is just about perfect for practice purposes. It has a really superior natural touch. The keys are weighted to feel just like the keys on an acoustic piano. Of course the weight counts especially for new piano players that are still trying to get their finger positions down. The natural feel of the keys makes it a far more valuable practice tool. You do not get the common clacking noise of the keys that you get with cheaper keyboard pianos. The Kawai KDP90 is so well made that every effort is put into making sure that the keys are as close to acoustic as possible including the lack of clicking that you often get from other setups. While this piano is not exactly the same size as an upright it does make an excellent option for areas where upright acoustic piano’s would be difficult to place. 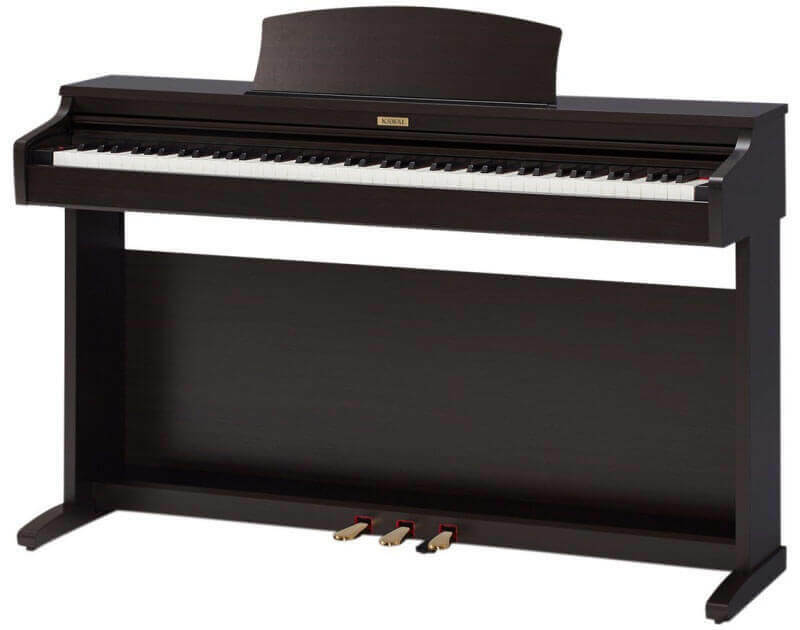 For example, if the piano has to be able to make it up a narrow flight of stairs the Kawai KDP90 may be the best option or even if you live in a small apartment and really do not have the room to spare for an upright piano. The craftsmanship that went into the Kawai KDP90 makes it as much a piece of furniture as it is an instrument. There is always room for improvement and while the Kawai KDP90 is easily best in class it is a little pricier than similar setups from other digital piano manufacturers, however in all fairness this is the highest rated electric piano among all competitors according to people that have purchased it. The build is portable but because it is so well-made you will need at least two people to move it, it is a really heavy instrument. As a matter of fact, it is surprisingly heavy which of course is a good thing if you are worried about durability and longevity but if you are planning for something really lightweight that can easily be moved by one person this is not it. The sound is good but not great. You do have to keep it in perspective because this is an electric piano not an acoustic piano. The sound does come very close to acoustic but it is not an acoustic and will not sound 100% like an acoustic. Frankly you would be hard pressed to find an electric piano that gets more accolades than the Kawai KDP90. Every person that has bought this electric piano and stopped to rate it gave it very high marks, perfect scores as a matter of fact. Everyone that has purchased this electric piano has been completely satisfied with it. If you need a great practice piano or even if you need a piano that can fit in a small space, then you should be considering the Kawai KDP90.